This is the bit that tells you how to adopt from us. All our cats and kittens are precious and we want to ensure the very best for them. They may have lost one or more of their nine lives already but we want to do our best to make sure that the remaining 8 are as healthy and happy as possible. As soon as they come to us the cats and kittens are health checked by the vet and treated for fleas and worms. They are vaccinated and microchipped and if old enough are also neutered prior to adoption. If they are not old enough, an agreement that you have this done as soon as appropriate will be a condition of adoption. If there are any health or behaviour issues we are aware of these will be discussed with you prior to adoption. We always homecheck before adoption so please don't be offended when we ask to do this. We're not coming to make sure you cleaned up properly or that your curtains match the cushions - we just want to ensure to the best of our ability that you are able to offer a "good enough" home and that the kitten or cat you wish to adopt will fit in with your family. So the kind of things we need to think about are how much space you have, whether you're close to a busy road, how long you're out of the house each day, what other pets or children you have, and, if the house is rented, whether the owner of the house is in agreement with you having cats. Unlike some of the larger, busier charities, we have no hard and fast rules and are happy to look at each individual situation and help find the 'right' cat for you. Homecheck is also an opportunity to discuss the specific cat you're interested in adopting, and to ask more about cat care. If you're adopting a kitten or young cat it could be a 20 year commitment so its important to think through the implications of this. It's the time to think seriously about the cost - not just of food but also insurance, vet bills, flea and worm treatment and the change to your lifestyle of having to be there for you cat, or make sure someone else is, whilst you're on holiday etc. Living with cats can be a delight - they make your house into a home, there to greet you when you get back from work, ready to purr and play and give the kind of unconditional love that only companion animals are able to give. However, they can also turn your home into a disaster zone, shedding hair on everything, throwing up on your best rug, clawing the back of the sofa and hauling home all manner of birds and rodents in a variety of stages between life and death. Just like us they get sick, grouchy and awkward. Adoption has to be "for better or worse, in sickness and in health". Donation: we do ask a minimum donation amount largely depending on what vet care the cat has had whilst in rescue - so if they've been neutered, vaccinated and microchipped the donation will be more. Rescues are sometimes accused of being greedy with their adoption fees, as people point out they can get a 'free' cat or kitten on gumtree. Free cats and kittens often come with free worms and fleas and other undisclosed health issues (including pregnancy). There really is no such thing as a free cat or kitten - once you've paid for worming, flea treatment, neutering, vaccination and microchipping its highly unlikely that it will have cost you less than the adoption fee. If you are able to donate more than the minimum we would be very grateful as this will help towards the next cat in need. After your homecheck it's the fun part ... meeting the cats. Some people come with a clear idea of which cat they would like to adopt, others come with an open mind, meet all of them and then decide who they get on best with. It could be a 20 year commitment so you need to make sure you like each other before you agree to adopt! I've seen very confident cats hide away from perfectly nice people presumably because they don't like them. Those people have gone on to adopt a different cat and given an excellent home to them. Other times a very timid cat decides s/he likes someone who has come to visit and takes front stage in the "adopt me" game. Once you and your potential cat have met you'll be able to reserve them and plan a date for them to move in. This needs a bit of planning. Ideally choose a time when there's not going to be lots of comings and goings in the house for a week or two, when someone in the family is able to be around quite a bit to help puss settle in. Whilst kittens can be reserved from about 6 weeks old, we don't let them go to their new homes until they are 12 weeks old. However you will be welcome and encouraged to visit a few times before they go home with you so can watch them growing and you can start to get to know each other. Check what food and litter your adoptive kitten/cat is having and stick to it for the first few weeks. There will be enough new stuff for them to get used to without tummies coping with digesting a different food, and adding to confusion about where the toilet is. Of course you can change to whatever you like once your new family member is settled - it's worth introducing the new stuff gradually though to avoid any upsets though, and keeping to a decent quality food. Have a think about where to put food bowls and litter trays before the cat arrives so you can have it all set up ready for them. It's worth initially having everything they need in one room and limiting access to the rest of the house, as exploring a whole house can be daunting for the new arrival, especially if s/he is only a kitten. 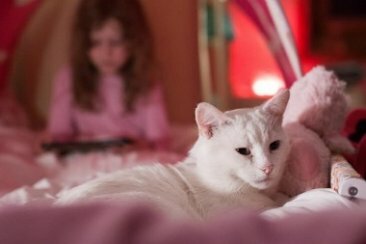 Your new cat must be kept indoors until s/he is at least six months old and is spayed/neutered, vaccinated, microchipped, and has had at least 2-3 weeks to settle into their new home. So it's worth giving some thought to how you will manage this from the moment they arrive. Ideally, keep two doors between your new cat and the outside. We always take our cats to their new homes, and spend a little time with them there. That way the cat/kitten has the reassurance of being with someone they know on the journey and in the earliest stages of settling in. Having a new family member is very exciting and of course the first thing you will want to do is shower your new cat with fuss, treats and instantly introduce him to all his new toys and other family members (human and furry) and invite your friends round to meet him. Sadly - this is the last thing s/he will appreciate. Chances are s/he'll come out the carrier, run under the sofa / sideboard / bed and that's the last you'll see of them for a while. They need some time to get used to the new sounds, sights and smells and will come out to explore when they're ready. It's not easy persuading children that this is the case - so it's worth talking to them about it before hand and reinforcing the message gradually when you're talking about the new arrival. Do remember to give existing pets plenty of fuss so they don't feel pushed out. Be prepared for it not to be entirely easy at first. Some cats will hide for several days or even weeks if they've had a difficult life prior to coming into rescue. Stay calm, give them some space, make sure they have food and litter tray accessible and they'll gain their confidence gradually. It's very likely that there will be some hissing and growling with existing pets initially. Again,don't panic, it takes time. Check out advice in the link below. The International Cat Care web site has some useful information about settling your cat into their new home. We promise we won't hound you for the rest of your cat's life ... however we do ask that you keep in contact initially at least until your kitten/cat has settled in. If there are difficulties with settling we're happy to try to help. For our peace of mind, we ask that you let us know when you've had your kitten neutered - we might send you a gentle reminder when they are 5-6 months old. 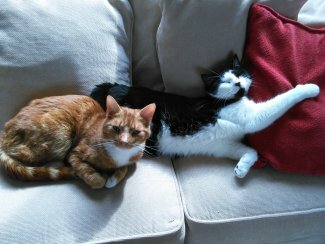 It's really lovely to hear a bit more about what our ex foster cats are doing and to have the odd photograph. We like to share some of these on the 8Lives blog and facebook page though we're careful to not identify details of the cat's new family.